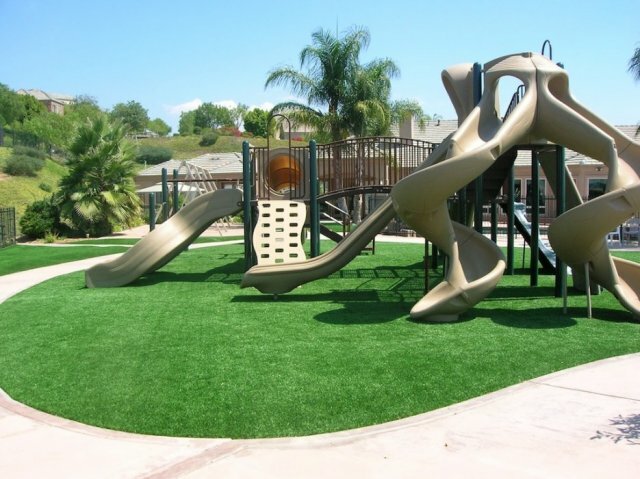 Playgrounds Houston is a leading supplier SurfaceMax Play Turf to Houston area playgrounds. SurfaceMax Play Turf is designed to bring the natural look of grass to your playground with lower maintenance. The Play Turf is designed to provide the proper impact fluctuation for playgrounds at a range of fall heights, and it is a great option for ADA Accessibility. Play Turf allows a free flow of water, enabling the playground to be used immediately following heavy rain. Water migrates through the fibers to perforations in the synthetic grass backing. Gravity causes the water to penetrate the perforations and enter the porous base mat. It then runs horizontally to drainage outlets or percolates into the crushed stone and/or soil base. The tough combination of polyethylene and polypropylene fibers resists wear and tear from foot traffic and the elements to form one of the longest-lasting surfacing options on the market. The industry’s longest warranty adds to Play Turf’s outstanding value. Options available for playground & stadium applications. Playgrounds Houston is a leading supplier of SurfaceMax Shredded Rubber Surfacing to Houston area playgrounds. SurfaceMax Rubber Surfacing provides an extremely durable, ADA accessible alternative to traditional playground surfacing. Made from clean, shredded recycled rubber, SurfaceMax Shredded Rubber Surfacing is easily installed and virtually maintenance-free. This innovative surfacing option is available in five non-toxic colors that won’t rub off onto kids or their clothes. Playgrounds Houston is a leading supplier of SurfaceMax Premium Tile to Houston Areas playgrounds. SurfaceMax Premium Tile offers a durable and remarkably resilient recycled rubber granular surface for years of safe play on your playground. SurfaceMax Tiles are available in various thicknesses to provide the appropriate amount of impact for the critical fall height of your structure or play event. Tile surfacing allows for easy replacement of small areas of surfacing. Premium multicolored tiles, custom edging options and ADA accessible ramp tiles are also available. Playgrounds Houston offers SurfaceMax Poured Rubber Surfacing a leading playground surfacing product made from recycled materials and is installed in thicknesses from 1-1/2″ to 4-1/2″ designed to absorb impact from specific fall heights. The surface layer can be specified in one or a combination of 12 colors, and the impact layer provides absorption of impact for complete with professional installation. Poured in place surfacing is an excellent choice if you want to reduce maintenance costs for the life of the playground. Check out below for all new Poured Rubber surfacing options that can work with most budget types! Playgrounds Houston is a leading supplier of SurfaceMax Bonded Rubber. SurfaceMax Bonded Rubber is the latest in playground surfacing technology. The material consists of a shredded recycled rubber tire material that is coated and mixed with polyurethane binding, creating a seamless surface that provides excellent impact absorption. With adequate drainage, Bonded Rubber Surfacing will not freeze or absorb water, encouraging play during all seasons. Due to freight costs, all colors may not be available nationwide. Playgrounds Houston is a leading supplier to the Houston Area for SurfaceMax Engineered Wood Fiber. SurfaceMax Engineered Wood Fiber is specifically designed and engineered for impact absorption on playground surfaces and carries a ten-year limited warranty for the ASTM standard. Play & Park Structures suggests the use of wear mats and periodic maintenance including additional fiber as needed to maintain the required depth. When compacted, SurfaceMax Engineered Wood Fiber meets the ASTM standard specification for determination of accessibility of surface systems for playgrounds.